​the scholarly study and appreciation of comic art, including comic strips, comic books, comics albums and graphic novels, magazine and newspaper cartooning, caricature, and comics in electronic media. For info on morning transportation options and evening shuttles, see "Getting Around Davenport" on the ICAF Conference Information page. 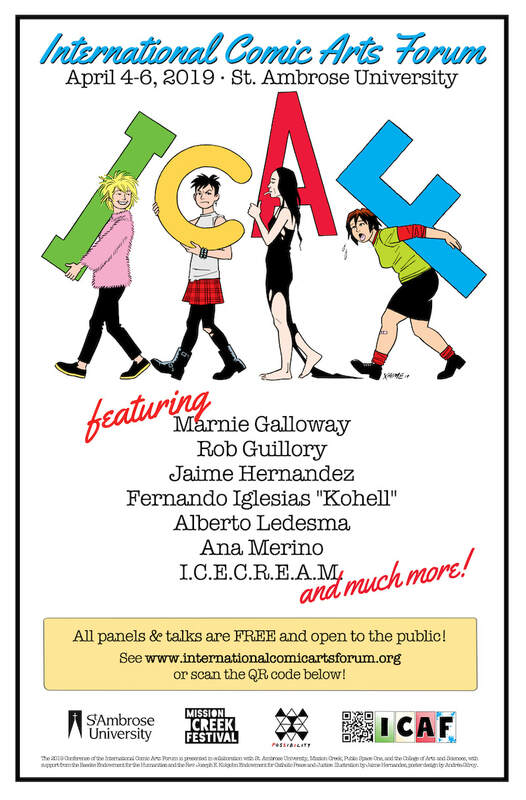 The ICAF 2019 Schedule of Events is now available, featuring special guests: Marnie Galloway, Rob Guillory, Jaime Hernandez, Fernando Iglesias "Kohell", Alberto Ledesma, and Ana Merino. Congrats to Francesca Lyn, our 2019 John A. Lent Award Recipient! Browse the latest International Comic Arts Forum Comics Scholarship Bibliography (Aug 2018 - Jan 2019) Edition. ICAF was founded at Georgetown University in 1995 by Tristan Fonlladosa and Guy Spielmann.